Dr. Matthew Becker, the W. Gerald Austen Endowed Chair of Polymer Science and Polymer Engineering, was selected to demonstrate to Congress his work and research with technological advances in contributions to veterans’ health. 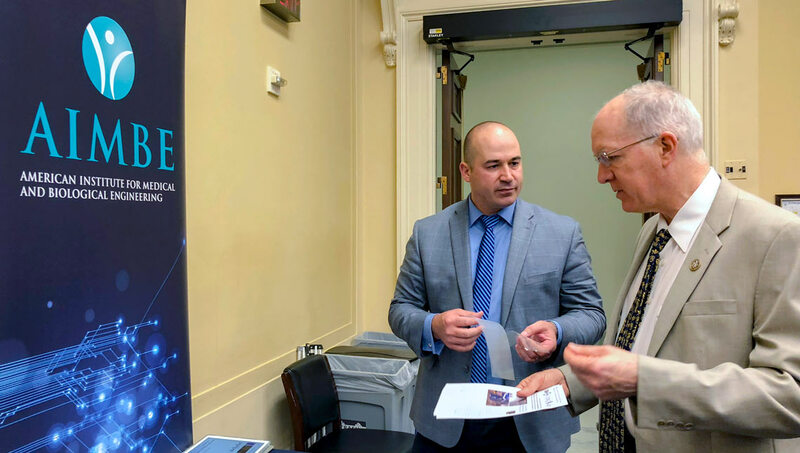 Along with other highly esteemed bioengineers from government, academia and private enterprise, Becker appeared Tuesday in the U.S. House of Representatives in Washington, D.C. at the Veterans Technology Showcase, sponsored by the Congressional Research and Development (R&D) Caucus. Dr. Matthew Becker discusses his research team’s work on non-opioid pain management with U.S. Rep. Bill Foster, D-Illinois, the only Ph.D. scientist currently in Congress. Specifically, Becker demonstrated his work on segmental bone defect repair and the use of drug loaded resorbable meshes for non-opioid pain management. Becker was selected by the American Institute for Medical and Biological Engineering (AIMBE) and the R&D Caucus. He was inducted earlier this year into the College of Fellows of AIMBE and has an active grant from the U.S. Department of Defense for his research. Becker’s work involves developing degradable polymer shells that will facilitate limb salvage in soldiers following dramatic gunshot wounds and explosions from IEDs (improvised explosive device). The degradable polymer shell bridges the gap where bone is missing following injury and degrades as the bone grows back. The shells are being manufactured by Cook Medical, which is the largest privately held biomedical company in the United States. The polymers were licensed from the University of Akron by Becker’s startup company 21st Century Medical Technologies. An ongoing trial on sheep is proving to have good results. The project is a collaboration of Houston Methodist Research Institute, the University of Akron, Cook Biotech Inc. and Texas A&M University. The non-opioid pain management is a collaboration between the University of Akron, 21st Century Medical Technologies and Merck Pharmaceuticals. It is funded by the Ohio Department of Development. AIMBE works closely with the R&D Caucus to inform on public policy issues concerning the medical and biological engineering community. The bipartisan Caucus is chaired by Representatives Bill Foster (D-IL) and Barbara Comstock (R-VA). The goal of the event was to highlight the efforts made by both public and private organizations to enhance the recovery of wounded and disabled veterans and service members.